Complete automation of accurate, lossless cutting and packaging filling. The Clean Packer is our best-selling product, in use throughout Japan, from Hokkaido to Okinawa. We have continued to upgrade the product with the latest high-tech technologies and our own knowledge and experience, gaining rave reviews for all aspects of the product, including its ease-of-operation, processing performance, value-for-money, and ease of cleaning. 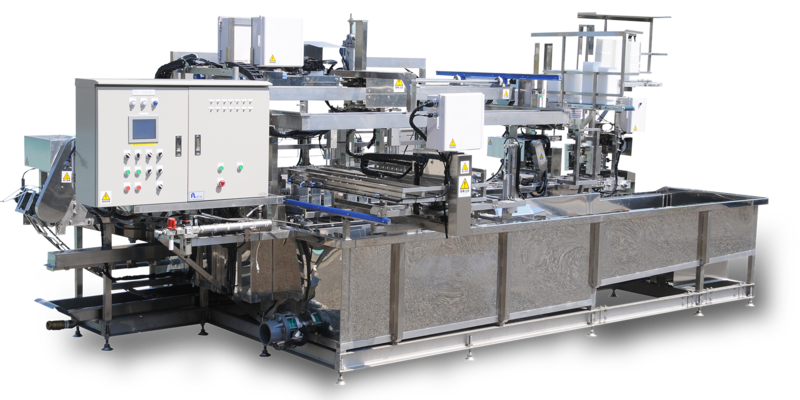 The Clean Packer is an automated tofu cutting and packaging filling device whose true value is proven when customers actually use it. Why Choose the Clean Packer? The equipment within the tank can be easily removed with a single touch, allowing thorough cleaning to be completed quickly. How to operate the equipment is simple and clear. Work progresses simply by the operator pressing “Yes” and “No” buttons to prompts displayed on the monitor. Anyone can easily use the product without worrying about operator error. The equipment automatically stops when an issue with the packaging machine or another component occurs, and the location of the source of the problem is displayed on the monitor. The package-filling part supplies water, which flows above the cutting part, so cloudy water from the cutting part does not end up inside the packages. There are various types of Clean Packer models available, depending on the products you intend to manufacture or the application for which you will use the equipment. The equipment can be outfitted with the features that today’s factories require. •The mesh for firm tofu can be placed on the top of packs, while for silken tofu, the cut surface can be placed on the top of the pack. •Switching between firm and silken modes can be done quickly and easily. * As long as the A dimensions are the same, the B dimensions and number of molds are free to differ. •Because one machine can process tofu cut into different sizes, space is saved and your investment is more efficient. •Switching sizes can be done quickly and easily. * The same model of box can be used, and the number of molds can differ. * Please feel free to inquire about other size ombinations. •Tofu is dice-‑cut horizontally, vertically, and to the right height. Silken, firm, and roasted tofu can all be subdivided into the desired sizes. •The cut tofu falls to the front, with the cut surface on top. The final row can also be made to fall to the rear with the cut surface on top. •The serrated and straight blades can be switched out with a single touch. We also provide various dedicated devices other than those shown above. Please feel free to contact us for more information. The processing capacity and machine size is determined by the mold‑box size and the number of pieces of tofu handled at once, so please make an inquiry. Reliability attested to by a record of over 400 units delivered. We have full confidence in the Clean Packer, which has been very well‑received by countless users throughout Japan. Since putting the machine on the market, we have continued to make various improvements and have dramatically improved performance, ease‑of‑use, and convenience. The Clean Packer will continue to change and improve. Doesn’t your factory need one, too? We have full confidence in your satisfaction. We continuously offer viewing tours of factories to which Clean Packer units have been delivered. Also, please inquire if you require more detailed information.